Collagen sheet dressing is a common procedure for covering exposed dermis of superficial thermal burns. It covers the exposed free nerve endings in the dermis, thereby reducing pain and infection. Skin graft is one of the commonly done procedures by plastic surgeons, dermato surgeons and general surgeons. After harvesting the split skin graft dermis is exposed at the donor site, resulting commonly with postoperative pain. Conventionally, the donor area is dressed with non-adherent petroleum gauze. In this study collagen sheet was used for covering the donor site after split thickness skin graft harvest. The donor site pain in the post-operative period can be assessed by numerical pain rating (NPR) scale. NPR scale involves asking the patient to rate their pain from 0 to 10 (11-point scale). The study compares collagen dressing versus traditional petroleum (Vaseline) gauze dressing on the donor site region of skin graft with reference to control of pain. The study does not assess wound healing role of collagen. The study was done from November 2014 to May 2016 in a tertiary care centre. The inclusion criteria were those with post-traumatic or post-infective raw area and surgically created defect. The exclusion criteria were children below 12 years of age, patients with burns whose analgesic requirement were more and difficult to compare with the study proposed, immunocompromised patients where wound healing may be affected, mentally-ill patients and any condition which influences pain recording. Procedure for the study included dividing the selected sample into two groups. The donor site dressing was done in two different ways. One was dressed with meshed collagen sheet which was dried with warm air dryer and other with petroleum gauze dressing. Randomly permuted block size of 4 which is the most effective method for small sample size randomisation was used in this study. The sample was split into groups of four, namely CPCP, CPPC, PCCP, PCPC, PPCC and CCPP. C stands for collagen and P stands for petroleum gauze dressing. Each block was randomly chosen, and samples were operated accordingly. For example, if CPCP is chosen, collagen was applied for the first surgical donor area and petroleum gauze for second. 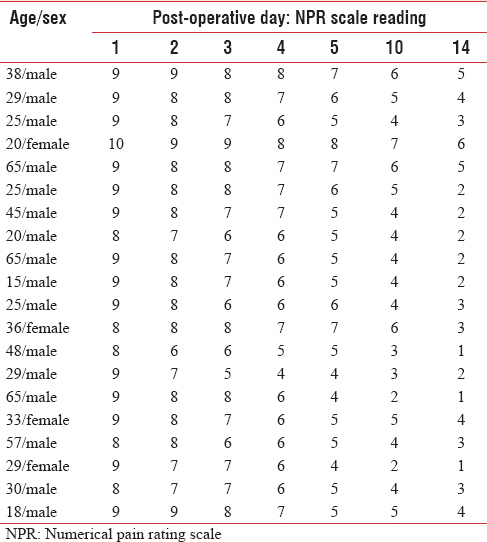 Assessment of post-operative pain was done by NPR scale from 0 to 10 (11-point scale), with the understanding that 0 represents one end of the pain intensity (no pain) and 10 represents the other extreme of pain severity (unbearable pain). All patients were prescribed paracetamol tablets thrice daily as analgesic. The NPR recording was done in morning before paracetamol was administered. Staff nurse did the recording of pain scale. The staff nurse was not aware whether patient had collagen or petroleum gauze dressing. Pain was recorded on the 1st, 2nd, 3rd, 4th, 5th, 10th and 14th days by NPR [Table 1] and [Table 2]. On the 10th post-operative day when the superficial dressing was changed by the surgeon, pain was recorded by staff nurse without seeing the wound. If the patient developed dressing soakage, in between, the dressing was changed immediately. Deeper dressing covering the collagen and petroleum gauze was not opened. Standard antibiotics were given to all patients for 5 days. Plan of analysis was based on statistics. 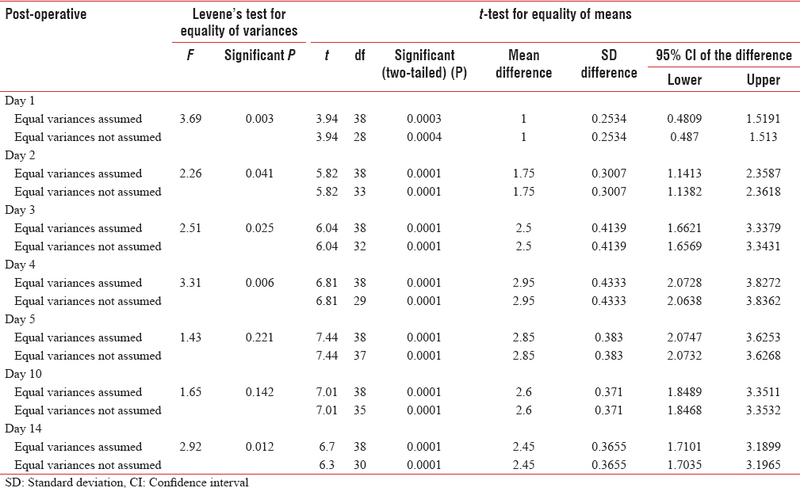 Statistical method used was independent two-sample t-test and Levene's test (Levene's test for determining the equality of variances and t-test for equality of means). Test of significance was set at P< 0.05. Null hypothesis was used meaning that there is no difference in pain between control and study groups. The observer bias, selection bias, sampling bias and response bias were eliminated in this study. From the population of a total of 52 cases operated, forty samples were chosen. Twelve patients were excluded from the study. 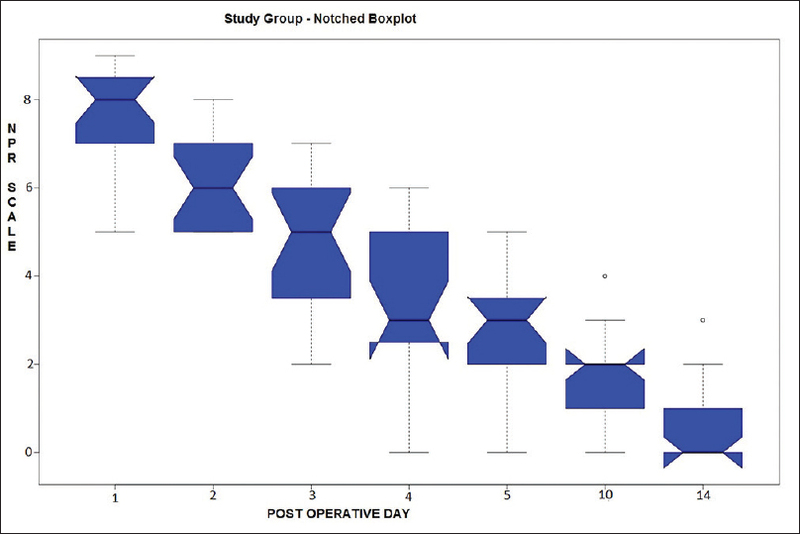 The reason being nine patients wanted early discharge, one patient in study group and two patients in control group developed infection on donor site during the 1st week. The sampling size was forty; collection of information on pain was done by the NPR scale. The source of information was from sample. 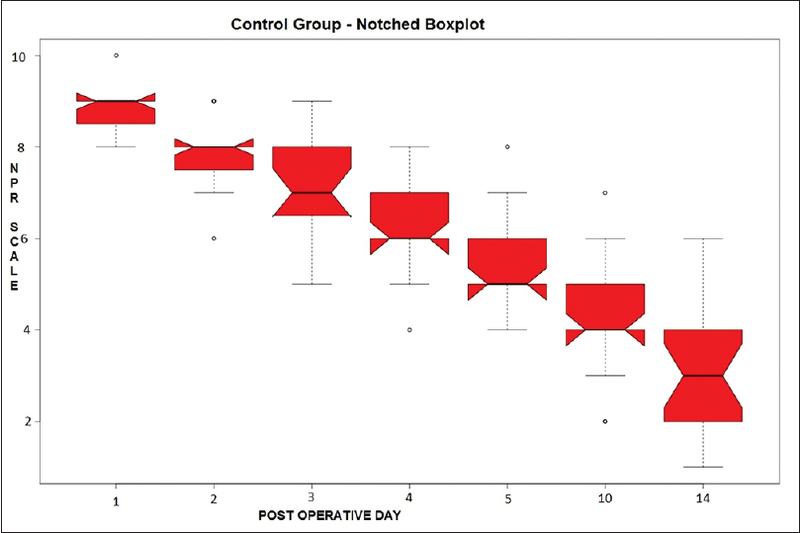 The data collected from control and study groups were represented on notched boxplots [Figure 1] and [Figure 2]. The pain was analysed using statistics in both groups on days 1, 2, 3, 4, 5, 10 and 14. The average pain score in study group (i.e. collagen sheet dressing) was found to be less compared to control group (i.e., petroleum gauze dressing). For our study, twenty samples of control and twenty samples of study group were selected. 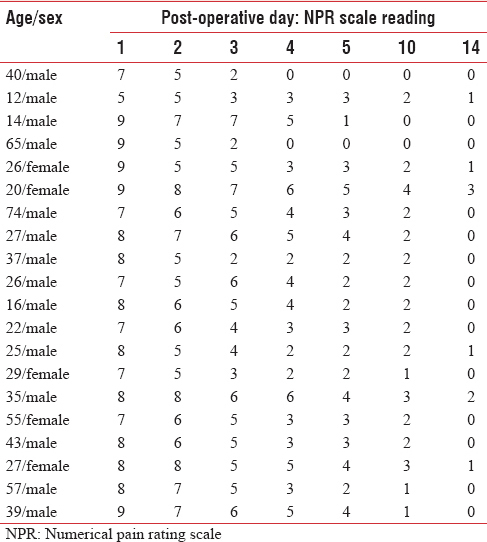 Out of them, 34 (85%) were male and remaining 6 (15%) were females [Table 3]. The control group age was in the range of 34.70 % 18.24 and study group age was in 36.70 % 19.52 [Table 4]. Statistical data provide detailed information regarding the study. Using inferential statistical methods, Levene's test F value was calculated on days 1, 2, 3, 4, 5, 10 and 14. Independent t-test value of study group and control group was analysed [Table 5]. Evaluation of results from tests, Levene's test of equality of variances and independent t-test showed that the study group had less pain. Therefore, the collagen sheet dressing was found to produce statistically significant reduction of pain (P < 0.05). The study design has adequately assessed the null hypothesis. The hypothesis is supported by the statistical results. Thus, collagen sheet was found to be superior to petroleum gauze dressing in reducing the pain in the donor site. We conclude that pain relief was superior with collagen sheet dressing when compared with petroleum gauze dressing and was statistically significant (P < 0.05). Singh O, Gupta SS, Soni M, Moses S, Shukla S, Mathur RK. Collagen dressing versus conventional dressings in burn and chronic wounds: A retrospective study. J Cutan Aesthet Surg 2011;4:12-6. Sreekumar NC, Bhandari PL, Praveen N. Comparative study of collagen and paraffin gauze dressing on skin graft donor site. Indian J Burns 2015;23:81-3. Halankar P, Gomes DC, Chaudhari C. Collagen dressing in the management of donor site of split thickness skin grafts. Bombay Hosp J. Available from: http://www.bhj.org.in/journal/april2005/htm/original_Collagen_114.htm. [Last accessed on 2017 Mar 02]. Nataraj C, Ritter G, Dumas S, Helfer FD, Brunelle J, Sander TW. Extra cellular wound matrices: Novel stabilization and sterilization method for collagen-based biologic wound dressings. Wounds 2007;19:148-56. Chung J, Wang XQ, Lindberg FP, Frazier WA. Thrombospondin-1 acts via IAP/CD47 to synergize with collagen in alpha2beta1-mediated platelet activation. Blood 1999;94:642-8. Kilinç H, Sensöz O, Ozdemir R, Unlü RE, Baran C. Which dressing for split-thickness skin graft donor sites? Ann Plast Surg 2001;46:409-14. Horch RE, Stark GB. Comparison of the effect of a collagen dressing and a polyurethane dressing on the healing of split thickness skin graft (STSG) donor sites. Scand J Plast Reconstr Surg Hand Surg 1998;32:407-13. Brett D. A review of collagen and collagen-based wound dressings. Wounds 2008;20:347-56. Fleck CA, Simman R. Modern collagen wound dressings: Function and purpose. J Am Col Certif Wound Spec 2011;2:50-4. Hassanpour SE, Moosavizadeh SM, Yavari M, Hallaj Mofrad HR, Fadaei A. Comparison of three different methods of dressing for partial thickness skin graft donor site. World J Plast Surg 2013;2:26-32. Martini L, Reali UM, Borgognoni L, Brandani P, Andriessen A. Comparison of two dressings in the management of partial-thickness donor sites. J Wound Care 1999;8:457-60. Muangman P, Nitimonton S, Aramwit P. Comparative clinical study of Bactigras and Telfa AMD for skin graft donor-site dressing. Int J Mol Sci 2011;12:5031-8. Voineskos SH, Ayeni OA, McKnight L, Thoma A. Systematic review of skin graft donor-site dressings. Plast Reconstr Surg 2009;124:298-306.